One afternoon, a couple weeks back, I was picking up Keyan from school on a particularly hot day. As we were walking to the car, Keyan started telling me how some of the kids in his class get to drink slurpees. Now I love me a slurpee on a scorching hot day or to fill a pregnancy craving. However, we don’t give our kids pop (soda) yet. So the first thing I did was to tell Keyan how all families and parents are different and do different things. He still kept asking about it and with the heat, we could all have used a cool drink. So I decided that we could make our own slurpees at home without using any pop. I made quick stop at the grocery store and then we headed home to make these delicious Homemade Slurpees with Juice. 1. Pour half the can of frozen juice concentrate into the blender (you can put the other half in a container and re-freeze for your next batch. 2. Add in the ice then pour in enough cold water to barely cover the ice. 3. If you want to add in a sweetener, you can. We did add sugar the first time but found it too sweet, so we didn’t add it the next time. It’s really personal preference. 3. Blend until everything is combined and slushy-like. If you have the option of ice crush on your blender, use that for the last 20 seconds. 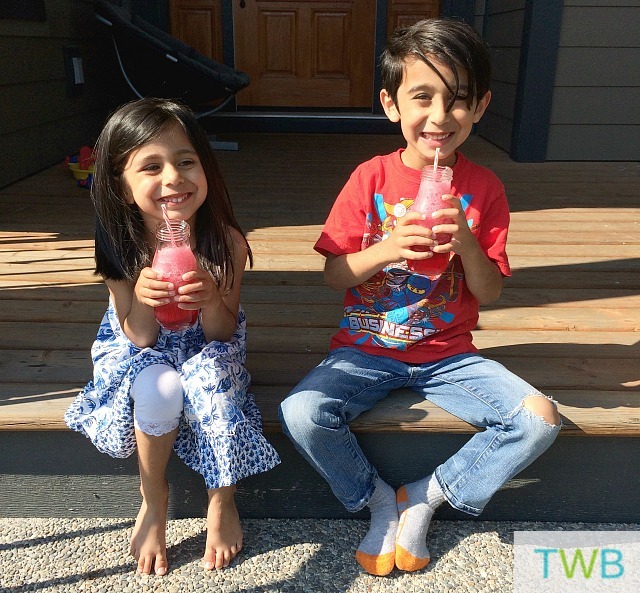 The kids loved it so much that they wanted the Homemade Slurpees again the next day! For more drink ideas, you can check my Pinterest Board for Drinks. You kids are adorable and I love this “natural” option to soda slurpees. I used to love drinking an iced green tea when we went to an oriental shopping center. Soooo refreshing. Ahh yes, iced green tea is very refreshing. This sounds so refreshing and is a versitile recipe. Some would need to stay away from fruit juice drinks (diabetics, for example) Francene’s idea of a tea slurpee sounds nice, too. I just did the same thing with my daughter last week. We used a teaspoon of frozen lemonade and a couple handfuls of watermelon and some ice…so refereshing! Yum, a lemonade slurpee sounds great! I hope you enjoy it Hirra, thanks! I always love your creativity! These juice slurpees look so refreshing for summer and love how you used those milk jugs! thanks Kamana. And it really is refreshing! Thanks for the recipe Salma! Kyla felt like having a slurpee the other day so we pulled out your recipe and made a pink lemonade slurpee. She absolutely loved it and I appreciate that it’s a “healthier” option to the store-bought slurpees. I am so glad she liked it Rahim! Thanks for stopping by and letting game know. It’s great to hear when others enjoy the recipes I post.